The Yankees magic number to clinch home field advantage is five, with seven games to play. They’re two games up in the loss column, which is good, but they’re remaining schedule is quite difficult – especially when compared to the A’s, who will face the Mariners and Angels. The odds are in the Yankees favor but, to be incredibly cliche, that’s why they play the games. With two series remaining, the Yankees will first travel to Tampa Bay. J.A. Happ spun a gem in the first game, throwing 7 scoreless innings and allowing just six base-runners (one of which was via HBP). It was his first of three scoreless outings for the good guys thus far. Miguel Andujar went 2-for-4 with a double and a solo home run in game two … and the rest of the offense went 3-for-28 with a double. Masahiro Tanaka allowed two runs in the first, but settled down nicely from there; unfortunately, the Yankees once again mustered only a single run – this one off of a double by Giancarlo Stanton. Check out Katie’s Yankeemetrics post for more (not so) fun facts. Wilmer Font, Jose Mujica, and Daniel Robertson have been added to the Rays fairly lengthy list of players that are done for the season. 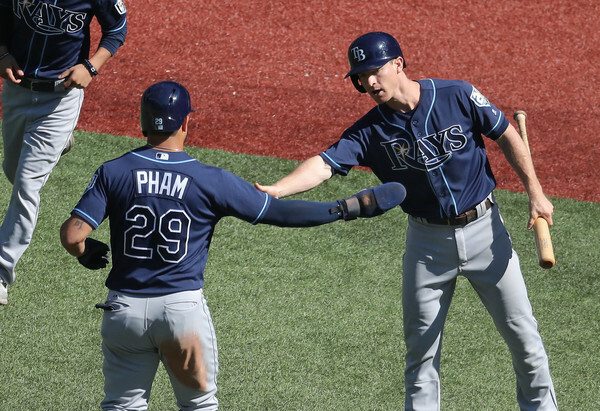 Ji-Man Choi and Kevin Kiermaier are also dealing with nagging injuries, though neither has hit the DL. The Rays are 87-68 with a +85 run differential, and have an incredibly slim chance at making the playoffs as the second Wild Card team. To do so they would need to win out while the A’s lost out, though, so the degree of ‘slim’ cannot really be exaggerated. That being said, it’s still kind of miraculous that this team has played so well since opening the season 3-12, considering that they are tied for the eight-best record in baseball with the Cleveland Indians. Their season has been unconventional, to say the least, but their bullpen/opener strategy appears to be catching on a bit more than expected – so this may end up being one of the more memorable non-playoff seasons in recent memory. Nick Ciuffo (73 OPS+) will probably see a start or two at catcher, and Carlos Gomez (80 OPS+), C.J. Cron (125 OPS+), and Austin Meadows (117 OPS+) will see some time in the lineup, as well. A 24-year-old rookie, Castillo has been quite good for the Rays this year. He has a 3.25 ERA (127 ERA+) in 52.2 IP, spread across 10 starts and 31 relief appearances. That’s right in-line with his 3.33 FIP, as he has solid strikeout (9.9 K/9) and walk (3.1 BB/9) rates. He’s faced the Yankees six times this year, pitching to the following line: 7.0 IP, 6 H, 3 R, 5 BB, 5 K. Castillo is a fastball-slider guy all the way, featuring a high-90s four-seamer and a high-80s slider. The Yankees, meanwhile, announced earlier today that Holder will get tonight’s start. Aaron Boone hinted at a bullpen game at some point this week as the Yankees look to get their pitching staff lined up for the Wild Card Game next week. There’s a chance Holder will be used as an opener with Sonny Gray set to take over in the second inning, after Holder faces the top of the lineup. The Yankees are trying to get their postseason rotation lined up and the Rays are using openers, so the starting pitchers for the majority of the series remain TBA. 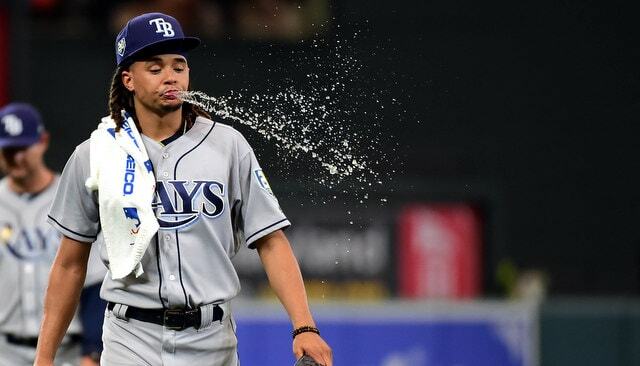 The Rays acquired Glasnow in the Chris Archer trade and he’s been league average for the Rays (4.11 ERA and 100 ERA+), throwing 50.1 IP with a 9.8 K/9 and 2.9 BB/9. Glasnow is similar to a young Dellin Betances. He’s got an upper-90s fastball and a hammer breaking ball. His strike-throwing ability varies on a game-by-game basis. The Rays bullpen has thrown 779.2 IP this year; the Angels are in second, with 606.0. That difference is greater than the difference between the Angels and the team with the fewest relief innings (the Indians with 440.0), so it’s kind of miraculous that the Rays bullpen is in the top-ten in all of baseball in adjusted-ERA this year. Their bullpen was showing signs of fatigue in late-July and early-August, but it has rebounded to the tune of a 110 ERA+ in the second-half. Sergio Romo is nominally the team’s closer, picking up 5 saves so far this month, but he has struggled this month, allowing home runs in three of his last five appearances, and is being used a bit more sparingly. Ryan Yarbrough (3.88 ERA in 139.1 IP) is the team’s long-reliever, with Yonny Chirinos (3.68 ERA in 85.2 IP) second-in line for those longer appearances. Jose Alvarado, Adam Kolarek, and Andrew Kittredge have been playing big roles for them of late, as well. 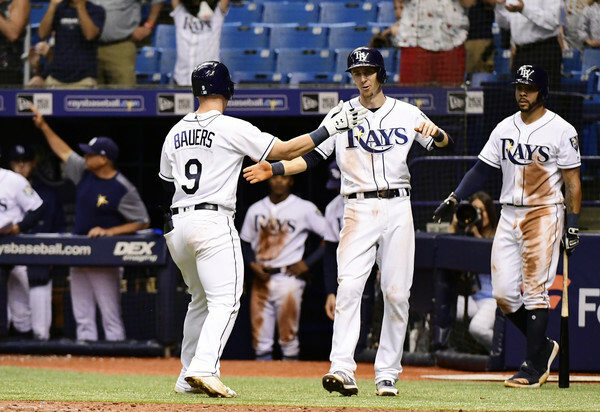 It’s a rivalry series with both team’s having something on the line, regardless of however fleeting it may be for the Rays – what more do you need? 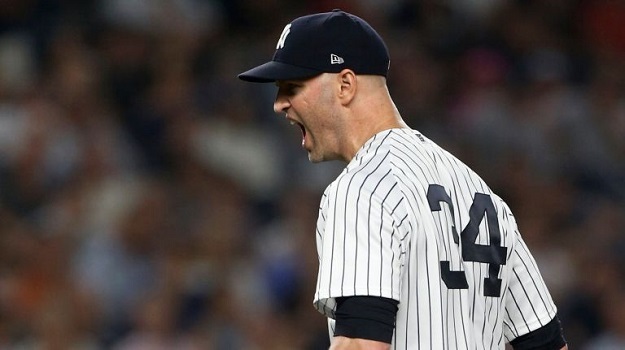 The week got off to a terrible start as the Yankees were embarrassed by their Big Apple rivals in a 8-5 loss on Monday. The Mets punished the Yankees pitchers with five home runs, the most the Yankees have ever surrendered in a Subway Series matchup. 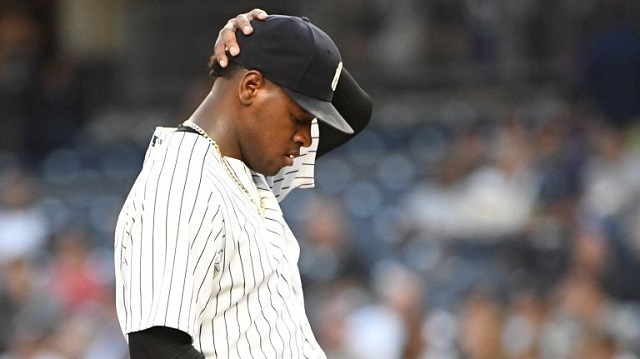 Luis Severino’s slump reached another level as he was blitzed by the weak-hitting Mets, coughing up four runs on seven hits — including two homers — in four innings. #NotFunFact No. 1: The last Yankee starter to allow that many hits and runs against the Mets in an outing as short as Severino’s was Jaret Wright on July 2, 2006. A.J. Cole entered in the sixth and immediately poured gasoline on the fire as Todd Frazier took him deep to lead off the inning, the first of three solo dingers Cole would give up before getting pulled with one out in the seventh. Thanks to that awful performance, Cole earned our #NotFunFact No. 2: He is the third Yankee reliever to allow at least three homers in a game while getting no more than four outs. The others were Darren Holmes (May 20, 1998) and Tom Ferrick (May 7, 1951). We’ll end this section on a positive note, with a milestone salute to the Gritty Gutty Brett Gardner, who hit his 200th career double. He is the 30th Yankee to reach that mark, but just the third to combine it with at least 200 career steals and 50 homers. The others: Derek Jeter and Roy White. The Yankees quickly rebounded from Monday’s misery, taking a 1-0 lead on an Aaron Hicks RBI single in the first inning against the Rays en route to a 4-1 win on Tuesday night. The victory made the Yankees an MLB-best 30-4 (.882) when scoring first in the opening frame this season. It was the first time in his career that he completed at least seven innings and didn’t allow more than one hit. It had been nearly four years since a Yankee pitched seven or more scoreless innings while giving up one hit or fewer in a game. That last guy to do it was Michael Pineda on Sept. 22, 2014 against the Orioles. And you have to go back four more years to find the last time a lefty achieved the feat, when CC Sabathia held the A’s to one hit over eight scoreless innings on Sept. 2, 2010. 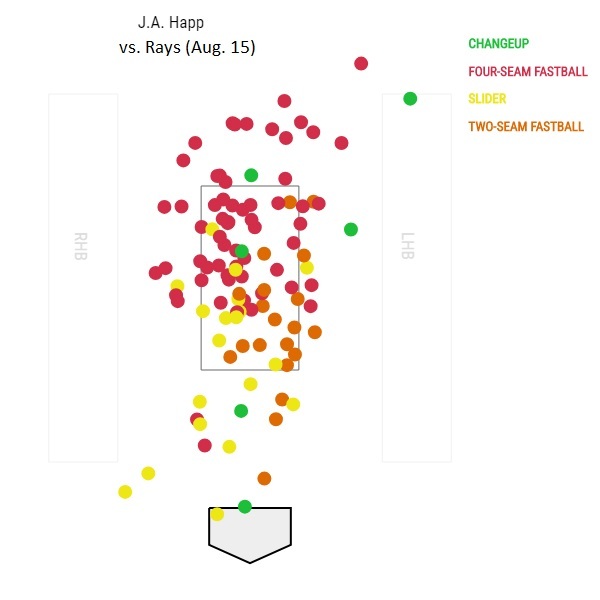 Happ was aggressive in pounding the zone with his fastball-heavy arsenal, but the Rays couldn’t square up his pitches as he located them on the edges and changed eye levels while carving thru the lineup multiple times. A ton of four-seamers up and two-seamers down kept the Rays off-balance and helped him get a whopping 30 foul balls, the most in a game by any Yankee pitcher this season. 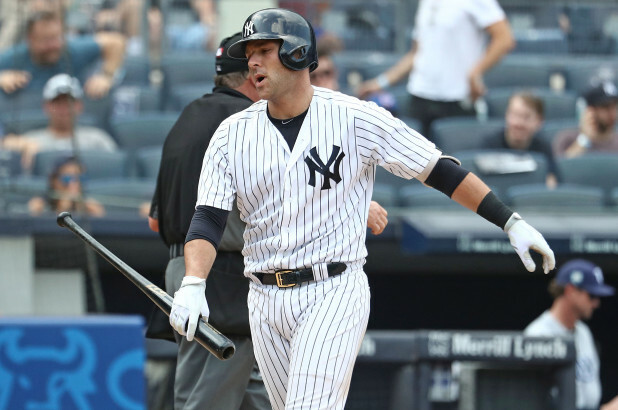 Austin Romine added a couple insurance runs in the fifth with an opposite-field shot to give the Yankees a 3-0 lead. It was his eighth homer of the season (in 199 plate appearances), one more than he hit in his 611 career major-league plate appearances prior to 2018. The last time he had eight or more longballs in any pro season was when he hit 10 homers at Double-A Trenton in 2010. 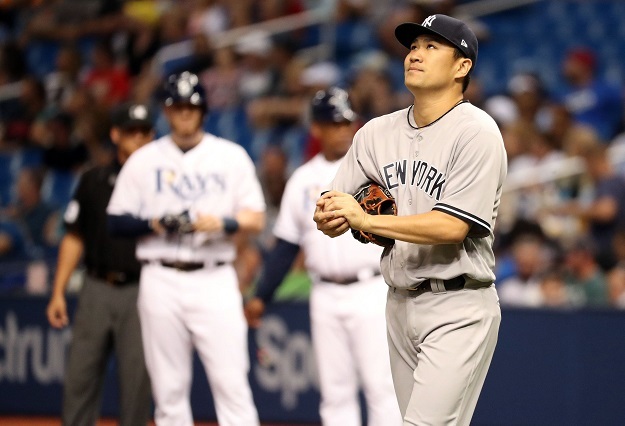 The one game win streak came to a screeching halt on Wednesday as the Yankees dropped a very boring game to Rays, 4-1. The bats fell silent in the clutch, going 0-for-9 with runners in scoring position while leaving a small navy of 10 men on base. Only one other Yankee pitcher in the last 10 seasons allowed at least five runs and seven hits in back-to-back outings of fewer than four innings pitched — Masahiro Tanaka last year on May 14 and May 20. Miguel Andujar was the lone offensive highlight, going 2-for-4 with a game-tying homer in the second inning and a double; the rest of the lineup was 3-for-28. 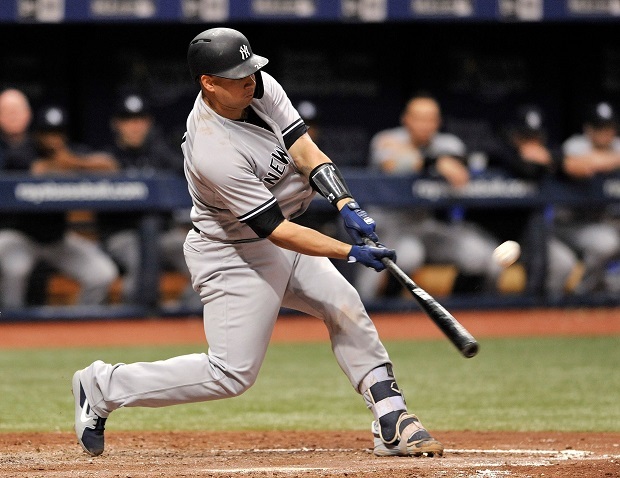 Nine of his 19 homers (47 percent) this season have either tied the game or given the Yankees the lead. The double and homer were his 54th and 55th extra-base hits of the season, the most by a Yankee rookie age 23 or younger since a 23-year-old Joe Gordon had 56 in 1938. It was deja vu all over again for the Yankees, who lost 3-1 to the Rays on Thursday as their offensive deep-freeze continued for a second straight day. They have lost 17 of their last 26 games against AL East teams, after starting the season 18-9 within the division. 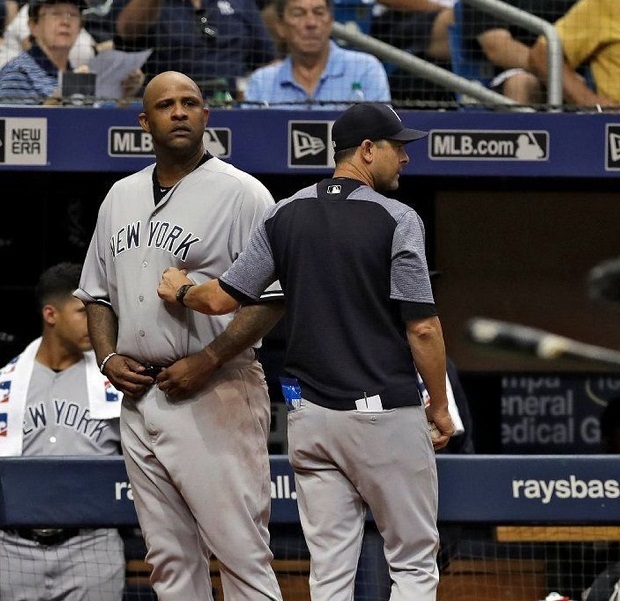 The loss was even more depressing because the Rays had been a virtual punching bag for the Yankees in the Bronx recently. They had won 12 straight home series against the Rays dating back to September 2014, their longest streak of series wins at the current Yankee Stadium against a single opponent. The last time they lost a series in the Bronx to the Rays was June 30-July 2, 2014 — the starting pitchers for the Yankees in those three games were David Phelps, Hiroki Kuroda and Vidal Nuno. But perhaps the most miserable stat is the fact that the Yankees couldn’t score more than one run on Wednesday or Thursday. This is the first time ever that the Rays have held the Yankees to one run or fewer in consecutive games within a series at Yankee Stadium (old or new). The clutch-hitting woes reached a peak in the bottom of the ninth when they loaded the bases with no outs and down by two runs. The Rays called on Adam Kolarek to get the final three outs, rookie who entered with zero career saves and 6.17 ERA in 23 1/3 major-league innings. The next three at-bats were a microcosm of the Yankees’ season-long performance with the bags full: Greg Bird popout, Brett Gardner strikeout, Austin Romine strikeout. To put that futility into context, this year teams with the bases loaded and no outs scored at least one run 83.5 percent of the time, and the expected number of runs scored in that situation is 2.3, per Baseball Prospectus’ expected runs matrix. The Yankees are now hitting .213/.263/.361 with the bases loaded this season, ranking 27th in batting average, 26th in on-base percentage, 24th in slugging percentage and 25th in OPS (.624). If you believe in history repeating itself …. The last time the Yankees finished with a bases-loaded OPS that low was 1991, a year that ended with the fifth-worst win percentage in franchise history; and the last time they finished with a bases-loaded batting average that low in a non-strike season was 1952, a year that ended with a World Series Game 7 victory over the Dodgers. Barring something statistically impossible happening, Tampa Bay will be the last .500 or better team that the Yankees face until they head to Oakland on September 3. That sounds like good news, right? The first game is probably the most notable, as it was the ‘lack of hustle‘ game for Gary Sanchez. He was, of course, placed on the disabled list the next day due to a re-aggravated groin injury, and has not played since. 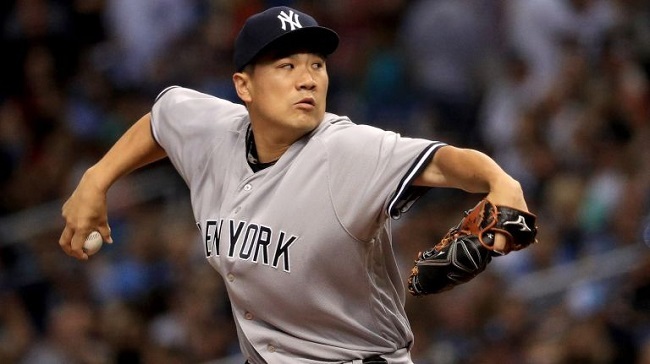 Masahiro Tanaka was brilliant in the second game, tossing a complete game shutout and striking out 9. Only four Rays reached base, three via single and one by a walk. Tanaka threw first-pitch strikes to 22 of 29 batters, and had a 16-to-2 grounder-to-flyball ratio. Miguel Andujar had two hits in each of the three games. Jose De Leon is out for the season with Tommy John Surgery, and Daniel Robertson (thumb surgery) is probably done, too. Jake Faria, Wilmer Font, Vidal Nuno, and the newly acquired Tommy Pham are all out, as well, and none are likely to be back for this series. The Rays are 60-58 with a +11 run differential, and are currently third in the AL East. They have an extremely outside shot of reaching the playoffs as a Wild Card team, as they currently sit ten-games back of the A’s, but it’s not terribly likely. And they sold at the trade deadline, sending Wilson Ramos to the Phillies, Chris Archer to the Pirates, and Jonny Venters to the Braves, so it’s not as though they’re making a push for that spot, either. Regardless, the story of their season was locked-in long ago with their decision to utilize openers this season. It may’ve been a matter of necessity, given all of their injuries, but a few organizations are doing the same thing in the minors, so this might not be the last we’ve heard of it. Michael Perez (153 OPS+ in 37 PA) will get a start or two behind the dish. A right-handed rookie, Wood has a 3.91 ERA (3.87 FIP) in 25.1 IP this season, with lots of strikeouts (26.8%), walks (11.6%), and grounders (47.8%). This will be his seventh start (opening?) of the season; his season-high for pitches thus far is 45, which occurred on July 29. He pitched against the Yankees on July 23, tossing two innings and allowing one run. Wood is a four-pitch guy, with a mid-90s four-seamer, high-80s cutter, mid-80s change-up, and a mid-70s curve. If the Rays follow their rotation, this start should go to Blake Snell. Snell missed a start or two with shoulder fatigue last month, and the Rays have been justifiably cautious as a result. He has thrown just 9 innings in his two starts since returning from the DL, throwing a combined 106 pitches. He left his last start after the fifth inning, despite being in the midst of a perfect game. 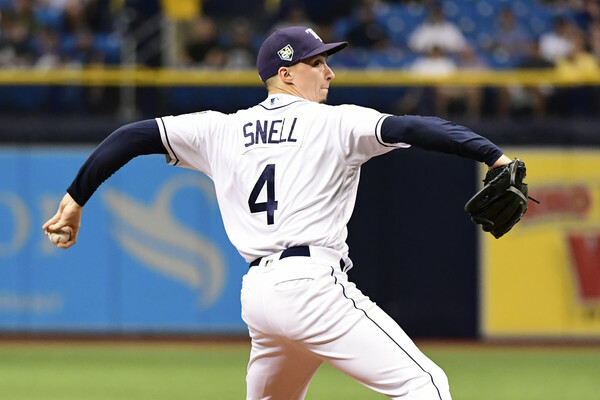 Snell has been one of the best pitchers in baseball this season, pitching to a 2.18 ERA (183 ERA+) in 128.0 IP. And this might be Ryne Stanek, who the Yankees are quite familiar with this season. Stanek has appeared in five games against the Yankees this year, pitching to the following line: 5.2 IP, 5 H, 0 R, 2 BB, 6 K. He’s been excellent this season on the whole, pitching to a 2.45 ERA (3.45 FIP) in 47.2 IP, with a 33.0% strikeout rate. 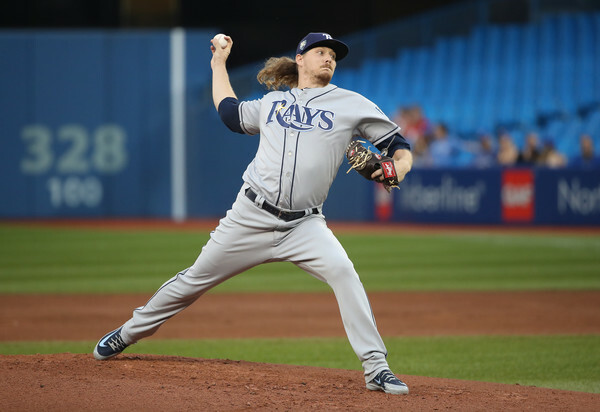 The Rays bullpen has struggled in the second-half, likely owing to the fact that the group has worked the most innings in the majors by more than 100 IP over the next closest team – and that doesn’t include the inning or two per game that the openers go. They have a 4.68 ERA in 127.0 IP as a group since the break, and their home run, walk, and groundball rates have all trended in the wrong direction by significant margins. Sergio Romo has emerged as the closer, with Jose Alvarado serving as the other late-innings option. Ryan Yarborough serves as the long reliever, so we’ll probably see him step in on one of the non-Snell days. The Yankees are 6-6 against Tampa this year, despite having outscored them by 15 runs. The Rays have a habit of being incredibly annoying, so it bears watching just to see if the Yankees can take care of business against an inferior team at home. And Boston is facing a surprisingly strong Phillies team, so this could be an opportunity to gain a bit of ground. 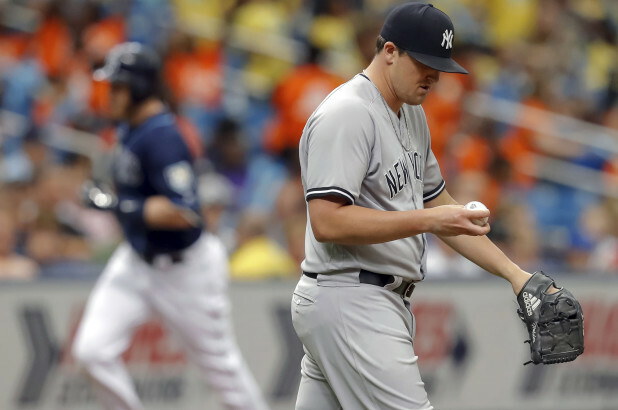 The Yankees opened up their quick road trip in Tampa with what had become an all-too-familiar result recently — a frustrating loss with numerous wasted scoring chances and unfulfilled rallies. 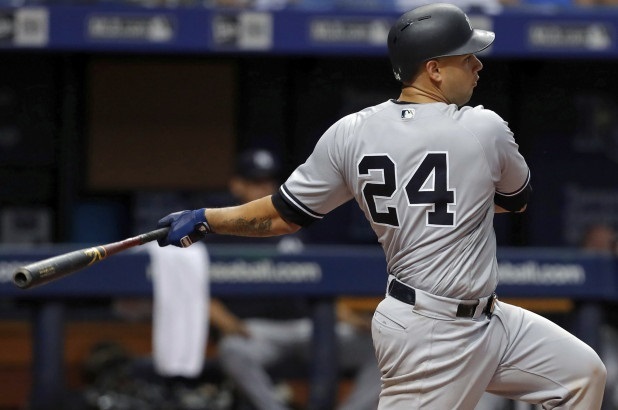 Gary Sanchez, who reportedly re-injured his groin early in the game and later landed on the DL, bookended the game with two seemingly lazy and costly plays. In the first inning he was charged with a passed ball that scored a run from second base and gave the Rays an early 1-0 lead. While Sanchez has a lot of defensive value based on his framing (top-10 per StatCorner’s metric and top-20 per Baseball Prospectus’ metric) and his strong arm (top-10 pop time and top-5 throw velocity, his struggles blocking pitches are no secret. He has 10 passed balls, tied for the most in MLB; according to Sports Info Solutions tracking, he has the third-lowest rate of successfully blocking pitches (88%). His season averages on max-effort runs are a 4.53-second home-to-1st and a 25.7 ft/sec sprint speed. He is now 6-for-45 (.133) in “Late and Close” situations (plate appearances in the 7th inning or later with the batting team tied, ahead by one, or the tying run at least on deck) this season, the fifth-worst batting average in the majors (min. 45 at-bats). Sanchez, though, was hardly the only Yankee to blame for the loss. Aaron Hicks had his chance to play hero in the ninth inning too, but came up small prior to Sanchez’s at-bat. Although his grounder scored a run to make it 7-6, he failed to get the cash-money hit with the bases loaded, a recurring nightmare for Hicks. After Monday’s failure, he was 3-for-38 (.079) with the bases loaded in his career, tied with J.B. Shuck for the lowest batting average among active players (min. 30 at-bats). Luis Severino also contributed to the Yankees early deficit, allowing a season-high seven runs and 11 hits — including two homers — before getting pulled in the sixth inning. It was the third straight game he coughed up multiple dingers, the longest streak of his career, and the third straight start he failed to get an out in the sixth. The only other Yankee in franchise history with three games in a row allowing at least two homers while pitching no more than five innings was Freddy Garcia in September 2011. The Yankees snapped their five-game losing streak against the Rays — which was tied for their longest ever in this rivalry — thanks to a dominant performance by Masahiro Tanaka and won 4-0 on Tuesday night. It was their eighth game allowing no runs this season, one more than they had in all of 2017. 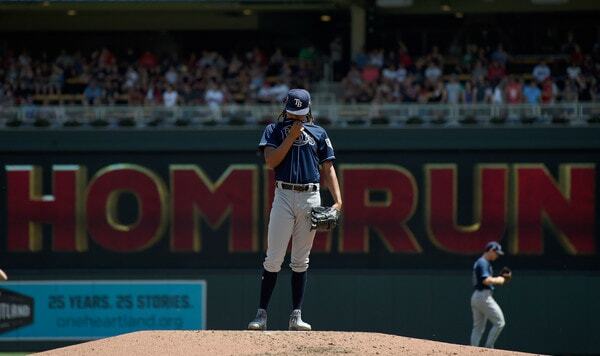 Tanaka was dazzling on the mound, throwing a three-hit shutout with nine strikeouts and one walk. He retired the first 12 batters, and faced just two batters over the minimum thanks to a couple inning-ending double plays. The most encouraging stat might have been zero — as in the number of homers he gave up (and runs). Tanaka had surrendered at least one longball in eight straight starts and 13 of his first 15 games this season. Instead, he was masterful in locating his nasty slider/splitter combo low in the zone and burying those pitches in the dirt. A season-best 82.9 percent of his sliders and splitters were thrown in the lower third of the zone or below the knees, and overall he got a season-high 16 outs via grounders. He joined Orlando Hernandez (June 22, 1999) as the only Yankees to throw a shutout at Tropicana Field. Tanaka is the first Yankee since Mike Mussina on August 17, 2003 against the Orioles to allow three hits or fewer and strike out at least nine batters in a shutout. This was Tanaka’s third career shutout; since his 2014 rookie season, all other Yankee pitchers have combined to throw two individual shutouts (Luis Severino this year and Brandon McCarthy in 2014). And finally, he is the first Yankee pitcher with at least three shutouts in his first five MLB seasons since Ron Guidry tossed 16(!) across his first five big-league seasons from 1975-79. Yankees are 7-14 at Tropicana Field over the last three seasons, their worst record at any AL ballpark, and tied with Twins (3-6) and White Sox (2-4) for the worst record at the Trop by any AL team since 2016. This season they are averaging 3.2 runs per game in six games at Tampa Bay and 5.0 runs per game in all other road games. Yankees are 0-4 in one-run games at Tropicana Field this season, and 6-4 in one-run games at all other road ballparks. Yankees have lost two series over the past two months — and both of them were at Tropicana Field (also June 22-24). The Rays were also the first team to hold the Yankees without a homer in a three- or four-game series this season. In fact, it’s the first time in nearly two years the Yankees have gone three games in a row without a dinger, since September 22-24, 2016. They have gone deep just once in five games since the break, their fewest homers in a five-game span since June 10-15, 2016 against the Tigers and Rockies. The Yankees entered the break with an MLB-best 161 homers; their one home run since the break is the fewest by any team.